What Types of Sounds Do Birds Make? Bird Noises - What Do They Mean? Birders who listen carefully to birds quickly learn that there are many different types of bird sounds that have different meanings and uses. Understanding these different bird noises and being able to distinguish them is the first step in effective birding by ear and identifying birds based on sound. It does take practice, but any birder can use sound as a reliable way to identify birds. Birds make a variety of calls, songs, and sounds with a language as complex as any spoken words. Each type of sound has a different purpose, and birds use them in different circumstances. Alarm Calls: These sharp, piercing calls are used to warn other birds of danger, and birds will use them when they feel threatened. Alarm calls are typically short but loud and sharp, and can carry over great distances. They are also often quick noises that can be repeated rapidly to warn of even greater danger. Alarm calls may also be used by aggressive or angry birds to threaten others or while chasing other birds away. Begging Calls: Made by young birds, these plaintive calls are designed to draw attention and may include small peeps, whines, rasps, wheezes, and chirps. Begging calls are not usually loud, but can be heard clearly in the vicinity of a nest. Juvenile birds will continue to use these calls even after leaving the nest, while they are still dependent on their parents' care. Begging bird sounds are frequently accompanied by wing flutters and other motions to attract parent birds' attention. Contact Calls: When birds travel in flocks or when they want to signal one another, they use contact calls. These are moderately loud chirps, chips, buzzes, and other simple bird sounds that are clear but not as piercing as alarm calls. Mates may use them to keep in touch with one another, or contact calls may be used to alert other nearby birds to a good food source. Flight Calls: Many birds have specific calls they will give only in flight, and these can be some of the most useful bird sounds to learn for identifying birds. A flight call may sound similar to contact syllables or it may be slightly more musical, but in general they are used for birds to announce their presence and location to others while moving. These calls are most common during migration, and birders can often identify birds migrating at night by their distinctive calls, even when the birds can't be clearly seen. Songs: Songs are the most distinctive and familiar bird sounds. These are longer, more elaborate, and generally more musical strings of syllables that have many purposes. Birds may use songs to attract mates, advertise their territory, or discourage intruders. The quality, duration, and variation of bird songs depend on the species, and there are also geographic song variations in bird populations. Birds may also have different songs for different times of day, or may only sing in the morning or evening. Some birds only sing during the spring, others may sing year-round. Some species, such as the northern mockingbird, are excellent mimics of other bird species’ songs and unusual noises. All of these sounds can be useful for identification, not only from the noise itself, but also from interpreting the birds' behavior that creates distinctive nonvocal sounds. Birders who are familiar with the different sounds birds make can use those sounds for auditory identification. For example, the type of call may give birders a clue of what to look for. Hearing an alarm call may prompt an observant birder to search for birds of prey nearby, while hearing a begging call may initiate a search for a well-hidden nest. When the bird is spotted, the noises it makes, including the pitch, tone, rhythm, and quality of its sounds, can help create a positive identification of the species. Birding by ear takes practice, but birders who understand the different types of bird sounds can use their ears as well as their eyes to find and identify birds in the field. 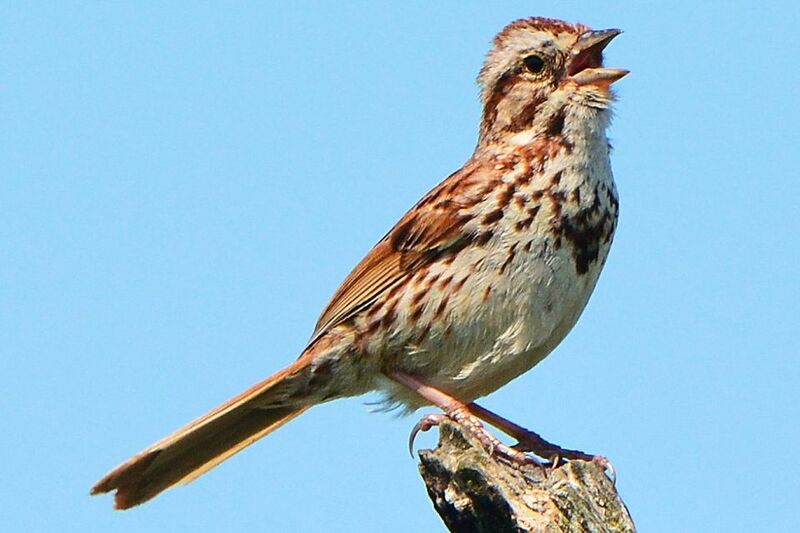 Birds Make More Sounds Than Singing - Learn Their Nonvocal Noises!